Whilst it is easy to find low carb options for lunch and dinner, breakfasts can seem a bit tricky initially. Standard Western breakfasts often include nothing but carbs – toast, croissants, cereal, porridge, bananas, fruit juices – all full of carbs and sugar (and likely to leave you feeling famished by about mid-morning). Traditional English breakfast is a bit closer to the low-carb standard with its bacon, sausages and eggs. However, it is probably a bit too heavy to have on a daily basis. Luckily, there are plenty of low-carb breakfast options and ideas. 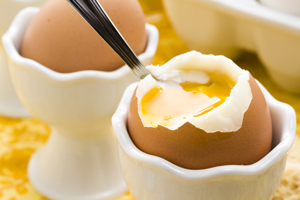 Check out this round-up of 30 best low-carb breakfast recipes. Finally, please also remember that breakfast is just another meal – it doesn’t have to include any special foods. If you are happy to have meat or fish and vegetables for your lunch or dinner, there is no reason why you can’t also have it for breakfast – it is simply a matter of getting used to it. Eggs are a traditional breakfast food and a very good low-carb option – one large egg contains only 0.5 grams of carbohydrate. There are many different ways to cook eggs – boiled, fried, poached, scrambled, omelletes, frittatas – the list goes on and on, so you never have to get bored. Smoked fish is another traditional favourite. Good quality smoked salmon can be a bit expensive, but there are cheaper options such as smoked mackerel and trout. Fish typically has zero carbs, but watch out for marinades and glazing that may be added, as these can have added sugar. Bacon and sausages is another obvious choice, very low in carbohydrate. You can also find low-fat options: bacon medallions, which exclude the fatty part, or turkey rashers (they taste surprisingly well). Beef sausages tend to have lower fat content than pork sausages. Ham and other smoked meats are also an option. Do opt for actual smoked meat rather than processed versions, as these can be bulked up with carbs. Always check the label for added sugars and other ingredients. Good quality ham should be at least 97% meat. Cottage cheese and Greek yoghurt are reasonably low in carb and high in protein, and can be quite nice for breakfast, on their own or as part of low-carb breakfast recipes. Vegetable frittatas can stand in for pancakes. Cauliflower and grated courgettes work well. Low-carb gluten-free flours (e.g almond flour, coconut flour) can act as a substitute for traditional high-carb flours. You can make most breakfast dishes using these flours – for example, pancakes, waffles, quiches and toasting breads. They will not taste exactly the same as their carb-rich counterparts, but will definitely help to bridge the gap to some extent. Check out this great book on low-carb baking by Peter Reinhart. Please also have a look at my collection of low-carb breakfast recipes on Pinterest.